Arriving at Malahide Castle just before 11 am gave plenty of time for tea/coffee and to meet with four other friends/members i.e. Paddy Ryan, Mary O’Dowd, & Joan Grace (Gleeson sisters formerly of kilriffith) & Mary Kennedy SHS member of Dolla & Clondalkin. Avoca teashop /restaurant and shopping outlet are situated near to the Castle. Malahide Castle & Gardens, managed & promoted by Shannon Heritage, Bunratty, Co Clare was home to the Talbot family from 1185 right through to 1976 – the year it was bought by Dublin City Council. 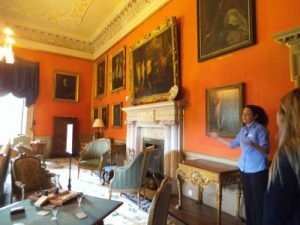 A tour guide took the SHS group through the Oak Room, the large Drawing Room, and The Great Hall and then up the staircase to the Lady’s Bedroom, (with spectacular views of the front lawns), the children’s room in the middle nd the Gentleman’s bedroom – both bedrooms have ornate adjoining dressing rooms. The final leg of the tour was to the ground floor ‘interpretive display on the history of the Talbots and Malahide Castle. Thereafter the impressive gardens were visited (included in €8.00 fee). They consisted of the West Lawn, the Walled Garden and pond etc. it should also be noted that there is an Exhibition and Learning Area for children plus a picnic and playground area. 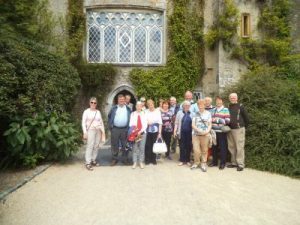 The SHS tour group spend the afternoon visiting the gardens and some took the 10/15 walk to the lovely village of Malahide to see its harbour and boats. Some also visited the Heritage Centre located in the Steward’s House beside the coach park. Killeen born Paddy Ryan & now Malahide resident and member of Malahide Historical Society. The Centre is managed and ‘manned’ on a voluntary basis by the MHS and it is a marvellous collection of artefacts, photos and memorabilia of old Malahide.